Need 4 digit codes to program my Dish remote to my Sharp LC-55P6000U?? Xfinity XR2 Remote. Press and hold setup button till led stays solid green, enter 11564, should flash green twice. Remote programming should be complete. So I have Xfinity and a Sharp TV/Remote what I want to be able to do is put TV/Cable off with ONE remote. Need the remote code for my Sky, no volume or tv turn off functions, all others are ok.
Sharp Ultra HD Smart LED 4K 49″. Do you know of any code that can work for my Sharp Aquos lc-24dhg6131k. I have a Sharp AQUOS LC-26GA5U that uses the remote GA331WJSA. Anyone with this model have a code that works? HIsense remote code works on Directv remote RC73. Just look it up by not knowing your model, and the 1st one worked. What remote control and code can I use for a SHARP AQUOS 4K LC-55UB3OU TV? I bought a tv spot came without a control. I bought a new universal remote and I am having a hard time setting it up. My tv model is LC-32SB28UT and I have the Universal for one brand, use for Sharp series: tv/lcd/LED/HDTV! What would the code be? Thank you! Hi guys, I recently brought a universal remote as the original sharp remote did not work. But I cannot sync it to the TV, sharp aquot 32 inch. Model number LC-32DHE5111K. Universal remote, “one for all” tried all the codes in the manual for Sharp tv’s and got nothing. Any solutions later me know. Hisense EN2A27 remote works with sharp tvs (sharp LC-65U) ? And if it does, how do I program it? Take Notice – The SHARP AQUOS 4K LC-N7000U 55 inch TV remote code for Dish Network uses Hisense TV Remote code 3519. The Sharp TV is marked on the back as being owned by Hisense. I went months trying to find a remote code that would work and today found out about Hisense owning them and the very first code tried for Hisense worked. I have a SHARP TV LC-13SH4U and I need the code for a new remote control coming from the cable company. I have tried all the codes listed on this page and no one is working. The new remote seems to accept only 3 digits codes. Is there a new code out for the new Sharp TV model number LC 43N610 CU for a dish system? 1206 worked for me on LC-43N6100U. I have a Sharp Aquos LC80UQ17U With Remote GB118WJSA…I bought a Cambridge TVB2 Sound bar. I need the code to make the soundbar work on the Audio button of this remote. Both Manufacturer’s blame each other and no resolution in sight. Go figure. I tried 1035 that didn’t work and was the only one I could find online…friend found 1916 going to try that tonite but at this point I’m not too hopeful. I have a One-For-All universal remote model #OARM01B and I’d like to use it on a Sharp TV model #19K-M100S, manufactured back in August of 1998, but I can’t find a code for the remote to operate the TV. I am looking for a code for my Sharp tv model LC40CFE6351K aquos using a universal remote. I have tried all codes with no luck at all. I have used 2 versions of one for all universal remotes, one was a smart remote the other standard. I can’t use the TV without a remote. Try 1206. That code worked for me. None of the Sharp codes worked, but this Insignia code worked, for some reason. I have a sharp aquos 55″ 4k smart tv LC55UB30U AND A Sharp brand universal remote EN2A27S i am trying to figure out what my code(s) are and what buttons to push before entering codes. Thank you!!! I have an LC-60LE847U tv and recently took Comcast cable service. The Comcast remote listed a dozen or so 5 digits codes to try to use the Xfinity remote with the tv, and none of them worked. Thank You Joe!! It worked! I just got the new XFINITY Voice Remote. (The Xfinity Rep who installed the cable gave up trying to get their remote too work!! What’s the remote code for Sharp TV LC-40CFE5221K. The remote code = 1378 worked on Sharp LC-50N600U TV for Dish remote. Thank you. The code I found that worked for my ONN universal remote was 5421 on a really old Sharp TV. I have the same tv. The code that worked for me was 1206. I need a code to program my LC-60N6200U on my dish remote. I have codes that will control volume with it but nothing to navigate and select in menus which I desperately need. I need a remote code for a Sharp TV model number LC32AD5EBK. 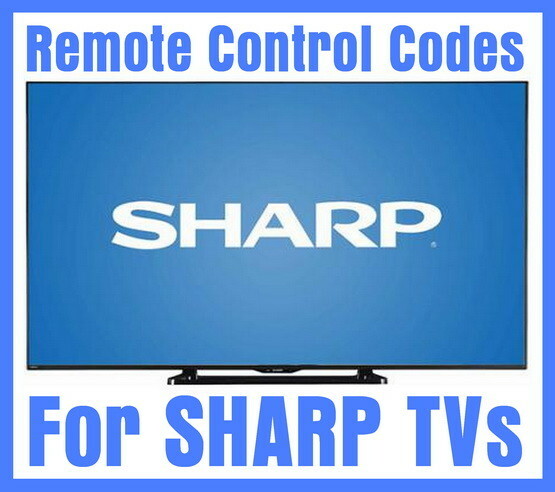 I need a TV remote code for my Sharp TV model number lc-60n5100u. I cannot work out which button to press on remote control to reset the tv channels. It’s a Sharp RC1910 remote control for a lc-24DV510K. There isn’t a code button to press after the power button. Sharp Aquos TV codes = 1077, 1078, 1081, 1097, 1099, 1004, 1009, 1011, 1025, and 1064. Codes for Sharp Aquos L20? Try these Sharp Aquos TV Remote Codes: 1004, 1009, 1011, 1025, 1064, 1077, 1078, 1081, 1097, 1099, 1153, 1157, 1274, 1298, 1311, 1312, 1362, 1375, 1378. If these do not work, let us know the remote control model number you are using to program your TV. Need codes fore an Aquos Quattron TV. Need codes for Sharp lc-32sh130k TV trying to connect to Elpine 31168c remote. Sharp Aquos TV with Chungchop Universal Remote, need codes. I have an lc-52le920un sharp aquos, trying to code my panasonic blu-ray player ir6 remote to it. None of these codes seem to work. Hold down the tv power button and press the code right? Suggestions? Thank you. Hello, I’m trying to use the RMT-U230 with the Sharp LC-19SB25U with no success, can you please help me? Can I use my LG DVD Player (DH4230S) REMOTE to control my old Sharp (Semi-Flat) TV? Yes try the codes listed on this page. I’m trying to program a Philips Universal Remote with a Sharp TV and or Sony DVD Player. What’s the instructions on that? What is the model number of your Philips Universal Remote? I have a Sharp LC-26SH12U TV with Sharp remote GB004WJSA. I need the code to allow it to control my Sony DVP-N77H blu-ray player. I have Sharp TV LC-32CFE6131K and need help with code to use on Bose remote. Doesn’t work. Only accept 4 digits. OK, try using these 4 digit codes for your Sharp Aquos TV = 1004, 1009, 1011, 1025, 1064, 1077, 1078, 1081, 1097, 1099, 1153, 1157, 1274, 1298, 1311, 1312, 1362, 1375, 1378. I have a sharp LC-50FE5101K and need help with code to use on sky remote, have tried all of the four digits ones but no luck…. ?